The large numbers marching in Manhattan this weekend need to be transformed into sustained momentum on a variety of targeted campaigns. On Saturday, September 20, one day before the People’s Climate March, over 90 members of Earth Quaker Action Team, or EQAT, conducted theatrical “climate disruption investigations” at two Manhattan branches of PNC Bank. With oversized cardboard magnifying glasses, we searched for evidence of the bank’s complicity in both climate change and potential human rights violations in Appalachia. Costumed “climate investigators” uncovered props depicting blown up mountains, poisoned water, destroyed communities, and close ties between the bank and companies engaged in mountaintop removal coal mining. Meanwhile, two Quaker teenagers from Florida delivered to a PNC branch manager a copy of a letter with our findings addressed to the United Nations, which will be hosting a global climate summit beginning September 23. The action was a creative example of acting locally and acting globally and the synergy between the two. While many people are comparing the People’s Climate March to the 1963 March on Washington, we should remember that international opinion played a role in the struggle for civil rights in the 1960s. In the midst of the Cold War, President Kennedy, in particular, was embarrassed internationally by images of violence against freedom riders and protestors in Birmingham, Ala. Surely President Obama would likewise be embarrassed by international attention to potential human rights violations within his own borders. And he should be embarrassed. When I was in South Africa two years ago doing interviews about climate change, Melita Steele of Greenpeace Africa shared her shock when she first heard that we blow up mountaintops just to get coal. “They do what?” she asked incredulously. Such international reaction is a vulnerability that frontline activists here could exploit more deliberately. EQAT’s action played on this vulnerability and built on an already established United Nations connection. In the spring of 2013, a U.N. Working Group on the issue of human rights and transnational corporations visited West Virginia to investigate the potential effects of mountaintop removal coal mining on human rights. Its report cited “the serious nature of the alleged adverse impacts, including impacts on health and water quality and the intimidation of those exercising their rights to express opposition to surface mining.” The report further stated that financial institutions “have a responsibility to prevent and address the adverse impacts” that result from their business relationships. 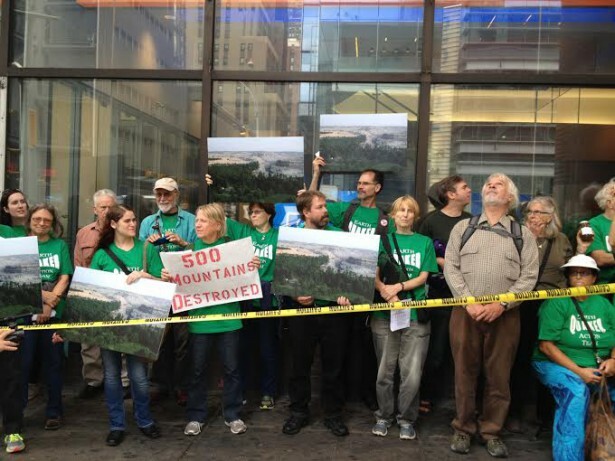 In other words, a global body raised the same concerns that EQAT has during its four-year campaign to get PNC Bank to stop financing mountaintop removal mining. While the United Nations should be an ally in highlighting the injustices inherent in extreme energy extraction, it should also be a target in the broader struggle against climate change, or climate disruption, as some are now calling it. So far, U.N. climate negotiations have yielded more words than deeds, a pattern Secretary General Ban Ki-moon is hoping to change with the upcoming climate summit. More than 100 heads of state will gather in New York, along with corporate and civil society leaders, in a less formal prelude to the official climate negotiations that will take place over the next 15 months, ending in Paris. Looking at the outcome of Copenhagen in 2009, it’s hard to be optimistic —although that process didn’t have a hundred thousand people marching in the streets to motivate those inside. Secretary General Ban Ki-moon himself plans to join in what is being billed as “the largest climate march in history,” with satellite events in 160 countries. Even though the New York route won’t even pass the United Nations, a huge turnout could still send a message to world leaders, especially President Obama, whose recent rule on carbon emissions from power plants is far short of what is needed. Pushing the president is important. To reach an ambitious agreement at the climate negotiations, the world needs a U.S. delegation more concerned with averting catastrophic climate change than arguing with China and India about who needs to change more: us or them. Given their dismal track record so far, we need sustained attention and pressure on the U.N. process, which could have been explained more clearly to participants during the lead-up to the march. Even more importantly, if we have any hope of impacting what happens at the global level — or on issues like the Keystone XL pipeline for that matter — we need to become a movement that is too big and too strategic to be ignored. That means translating the large numbers in Manhattan into sustained momentum on a variety of targeted campaigns, which brings us back to EQAT’s “climate disruption investigation” at PNC. Growing our campaign and our movement is part of EQAT’s goal for this weekend. We are using the influx of people to New York to reunite with some of the 200 Quakers from across the country who attended our action at PNC’s corporate headquarters in Pittsburgh on July 3, as well as many of the college students we worked with at PowerShift last October. We hope participating in a second EQAT action will cement their involvement with us as we expand our footprint to mirror PNC’s. We also wanted our Saturday action to tie into the march, where we’ll be walking alongside other people of faith, to draw the connection between the local and the global, between the frontlines of extreme extraction and the financiers who profit from climate disruption, and between our Quaker values and the human rights valued by the United Nations. As Ingrid Lakey, one of EQAT’s founders and Saturday’s action leader, explained, “As governmental leaders meet at the United Nations this week to address climate change, corporations like PNC must take responsibility for putting profits over people.” Whether it’s the bankers or the politicians, we know that it’s people shining a spotlight and pushing them to change that will make them. I am happy to say that it was way more than “a hundred thousand people marching in the streets” — over three hundred thousand! Eileen, thanks for making the clear linkages of our action to the Climate March, our campaign goals to the larger Climate Justice / Climate Disruption movement and that Quakers, people of faith, students, the elders, young people and the frontline communities in Appalachia (who we work in solidarity with) have a huge role to play in making change happen. My hope is that the 400,000 people who attended the People’s Climate March will feel inspired to go home and join (or start) strategic, nonviolent direct action campaigns to put pressure on corporations or governmental leaders to demand change. Thank you, Eileen, for making the connections between acting locally and globally. We can’t see what is happening in Appalachia as separate from what is happening in Alberta, Canada and South Africa.